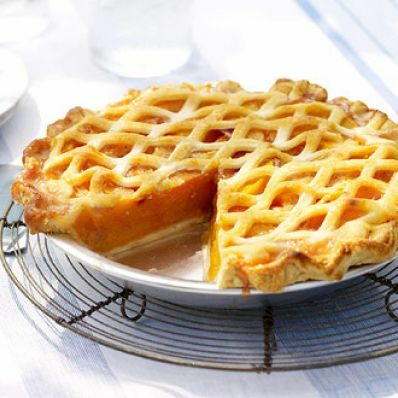 The easiest way to make a lattice pie crust is by using a pie-top cutter or small cookie cutters. Place the top crust over the filling, crimp and bake. 1 of 4 Heat oven to 375 degrees . Fit one piecrust into a 9-inch pie dish. Refrigerate while preparing filling. In a small bowl, blend 1/2 cup of the sugar, the cornstarch, salt and allspice. 2 of 4 Place peaches in a large bowl. Add sugar mixture and stir to combine. Pour peach mixture, scraping bowl, into bottom crust. 3 of 4 Unroll the second crust. Place a lattice cutter (visit confectionery house.com for options) on a cutting board. Drape crust over cutter and roll with rolling pin until piecrust is cut. Carefully lift crust from cutter and drape over pie filling. Fold top crust edges together and crimp decoratively. Brush with the egg white; sprinkle with remaining teaspoon sugar. 4 of 4 Bake pie at 375 degrees for 45 minutes. Lower oven temperature to 350 degrees and continue to bake for an additional 20 minutes, until fruit is bubbly and crust is nicely browned (tent with foil if browning too quickly). Cool on a wire rack for 20 minutes before slicing and serving.